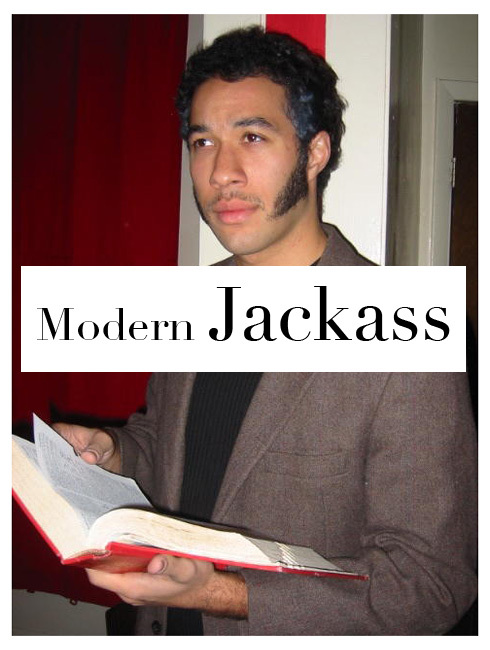 You know what a Modern Jackass is? Us neither, but that doesn’t mean we won’t pretend like we do and pontificate on it endlessly. The Modern Jackass is that guy you work with who passes off opinions he read in last week’s New Yorker magazine as his own. She’s the girl who condemns every original thought you have with a summary of Heidegger’s beliefs she learned during a discussion section for Culture and Criticism at Wesleyan. It’s the public radio host who coins the term and the “freelance” writers who steal it. The Modern Jackass is today’s renaissance (wo)man, adept at lying, affecting, and deluding zirself. The Modern Jackass pretends to know a little about everything but in truth don’t know nuthin’ ’bout nuttin’. Zie uses their limited French vocabulary in short stories they write to look more precocious; zie calls zirself a Buddhist; zie cries for worldwide poverty but doesn’t know who their Congressman is. Modern Jackasses are the people who talk too much. Modern Jackasses are the people you hate. Modern Jackasses, more importantly, are the people you, me, and we secretly are. If no one knows anything, then how can you ever be wrong? That’s the beauty of Modern Jackass; that’s its ethos, and this? This is its Magasin. I like your blog, and I was wondering if you would be interested in participating in an online Hulu Awards Ceremony. Hey you need a section that gives reasonably logical answers (but never verified) to random questions. Example: Q: Why do women like soup? A: Because its comforting, like grilled cheese sandwiches and chocolate ice cream. That is an incredible idea. Though I’m pretty sure you suggested that so we’d adopt the idea and in return you’d sue us for some sort of theft of intellectual property. If so, we’re stupid enough to fall for it. Well Played. “FAQ Ups” coming soon.